This has been a rough summer between multiple deaths in the family and a couple of prolonged illnesses. I'd prefer to keep my dead people in books but things don't always work out. My wife and I both lost a parent this summer and my Stark House work has backed up like a Miley Cyrus dance. 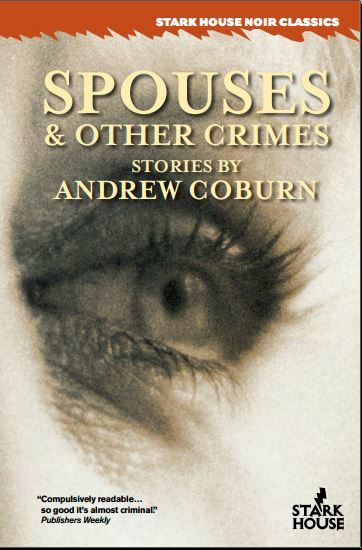 But there's something we need to immediately plug and that is the book release event at the Andover Book Store on 89 Main Street in Andover, Massachusetts for the great Andrew Coburn's first ever short story collection. Andrew has had some health problems of his own in recent years and this book's release is a big deal to both him and his family. If you are anywhere near the Boston area, Andover is a hop, skip and a jump from Lowell, birthplace of Jack Kerouac, and you can help make this event the smash it deserves to be. I'll be there, as well, and would love to meet as many Stark House fans as can make it. The event begins at 6:30 p.m. and I really hope that some of you wonderful crime fiction fans can make an appearance. My own book(s) should also begin shipping this week or next. The very kind Ed Gorman posted a very nice mention of both our next Peter Rabe volume as well as some kind words about a very humbled myself. Ed here: Before we get to the extremely important Peter Rabe trio I want to give a shout-out to the man who wrote the single best utterance I've ever read about Rabe. That would be Rick Ollerman. And that utterance leads off this trilogy. Rick's got cred not only as one of the savviest and wisest critics you'll find anywhere; he also has the same kind of cred as a novelist. 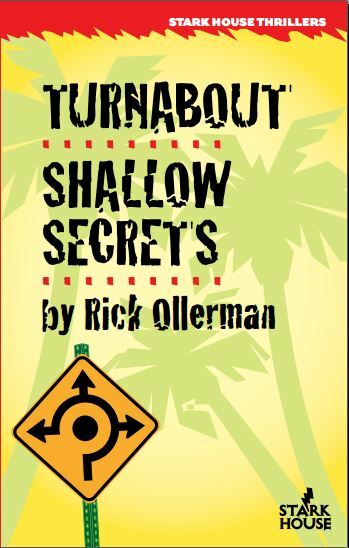 A while back Stark House published two of Rick's novels Turnabout and Shallow Secrets. If Gold Medal was still in business today these would be in their top ten bestseller list. The key word here is "today" because while the noirish elements may echo the Gold Medal masters the stories and the settings are very much contemporary. Nastily so. You want grim, you want fast-paced, you want in-your-face moments you'll find them here. But you'll also find nuanced characters and a style that serves the story yes but is capable of giving us real resonance and even a kind of ugly beauty. I not only enjoyed them I admired them. Sep 2014. 389 p. Stark House, hardcover, $19.95. (9781933586472). Remember those old Ace paperbacks, with two actioners in one volume? Stark House is reviving them, with the current offering holding all the slam-bang anyone might want. In Turnabout, ex-cop Frankie O’Neil is skeptical when a friend’s death is ruled suicide. He uncovers a crime unknown to the Ace masters: computer theft. These crooks have friends with guns, and halfway along the novel becomes a series of cliffhangers that hit another memory: movie serials. Will Frankie escape in time? Find out in the next chapter. You won’t stop until you know. Shallow Secrets moves slower, with a subtext: the power of chance to provoke horrors, then avenge them. Cop James Robinson doesn’t just know the accused killer. They’re roommates. The coincidence destroys his career. Then there are fresh killings, and Robinson is “a person of interest.” Near the end, Robinson almost tells a woman that “there wasn’t anything they could do to make the world safe” from murderers. But coincidence can bring them down, as when someone sees something he’s not supposed to. I also have two pieces in next month's NoirCon program book and a book signing in Minneapolis on October 16th and I truly hope that anyone in the Minneapolis/St. Paul area can make an appearance (along with everyone you know) and say hello. I'll be at Bouchercon in November on the "New Authors Breakfast" panel and my own room for an "Author Focus" session which may just be myself and a carafe of water. But if you're around and want to talk a bit and hang out, feel free to pull me over. Okay. Bigger newsletter to follow as things get caught up. In addition to Spouses & Other Crimes and Turnabout/Shallow Secrets, the first Peter Rabe Daniel Port omnibus will be shipping soon, along with a bonus offering of two fine Edgar Wallace novels. If you haven't ever read Wallace, he was huge in his time (hey, he created the original King Kong) and is sorely needing to be discovered by today's younger readers. So there will be more coming but that's the Emergency Newsletter Bulletin for the day.